Fencing: Endewearde 3, Malagentia 2 (Endewearde won the Youth Fencing, as all the entrants were Endeweardians, Malagentia won the five person melee and the castle battle, Endewearde won the field battle, and Thomas of Effingham was undefeated in the Cut and Thrust tourney and had declared for Endewearde). There were many allies helping Endewearde prove that the taxation of the roads in Malagentia were unjust. Here is a partial listing: Barony of Havre des Glace, Barony of L’ile Dragon Dormant, Barony of Stonemarche, and the Barony of Bergental. The three Thunder clans also joined Endewearde on the fields of battle. The Emperor of the East, Brennan, declared for Endewearde and brought his people with him. He sided with Endewearde to make the sides as even as possible (and probably because he hadn’t yet gotten his cut of the road taxes…). 😉 The Empress joined Endewearde’s forces on the fencing field. Standing with Malagentia were Serpentius and the Barony of Carolingia (and possibly others I have missed). 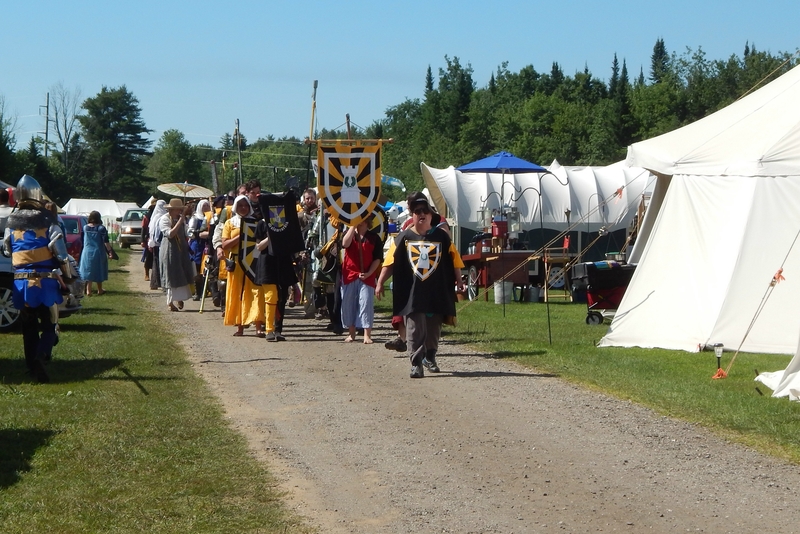 Several fundraisers were held over the weekend, and over $1500 was raised for the Pennsic State Dinner fund. There were donation jars at Baconpalooza and Papa’s Bar at the End of the World, and Smokehaus and the Second Wurst Fundraiser sold sausages, and hot dogs with all the fixings. Court was so long that there had to be an intermission in the middle, but many worthy people were recognized. Duke Kenric read an AoA scroll in Anglo-Saxon which had been written by Aneleda Falconbridge. There were several emotional moments, including when Camille des Jardins, newest OGR, was presented with a pin made by Master Gregory Finche for Don Jehan Fitzalan. The capstone was the induction of Maxton Gunn and Anna Mickel von Salm into the Order of the Laurel, with the presentation of handmade medallions and books. given. Malagentia gifted Endewearde with a hand made wooden candle lantern with one side bearing the moon of Malagentia and the other the tower of Endewearde; Master Christian Woolfe made this lovely gift! Endewearde’s gift to Malagentia included the following items: 2 rattan swords made by Lord William, a throwing javelin made by Lord Seamus, a pile of vambraces (arm guards) for archery made by Godric and other archers who shared the work, and a silk heraldic banner made by Lady Yzabel. Sounds like a marvellous time was had by all. I’m sorry to have missed it.